A season that started so promising for Reimer ended disastrously, with the former No. 1 starter getting shelled over the final few months of the season, prompting Jonathan Bernier to rush back from injury and play poorly himself. Reimer ended the season with a .911 save percentage, which is actually the fourth best by a Toronto netminder since Lockout I. Two of the three better seasons were posted by Reimer, and for as good as Bernier was last year, his overall save percentage was still lower than Reimer's franchise record setting mark of .924 set in 2012-13. Despite Reimer's poor performance last season, the majority of the blame lies with the penalty kill. Reimer posted a terrible save percentage on the penalty kill—something that tends of fluctuate like crazy from year to year due to the small sample size, and one that's usually awful behind Toronto penalty killers—but was generally decent at even strength. His .924 save percentage at even strength was 33rd out of 68 goalies with at least 500 minutes played, a higher mark than guys like Jonas Hiller, Cory Schneider, Jaroslav Halak, Ryan Miller, Marc-Andre Fleury, and Antti Niemi. Reimer wasn't his best last season, but he is not a problem for the Leafs. Unfortunately, his contract status is a bit of a problem. He's an RFA and should be due a bump on his $1.8 million salary. He also wants to be a No. 1 goalie, something he won't be in Toronto with Bernier entrenched as the guy. He's a UFA next year, so signing him to a 1-year deal means you lose him for nothing at year's end. 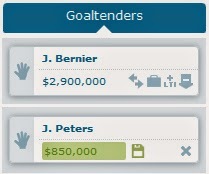 ... because Bernier has yet to prove he can handle a full season's workload. He was excellent last season, but only got into 55 games thanks to a late season injury. The maximum amount of games he has played across any level, dating back to when he was 15, is 58 games (in the AHL in 2009-10). Accordingly, the Leafs can't just punt the backup position because they probably need a competent goalie for 20-30 games, maybe even more if Bernier can't stay healthy. That's one reason why the Leafs should seriously consider keeping Reimer, although it seems like a foregone conclusion at this point that he's leaving. Otherwise, the Leafs need to spend some money to get a capable backup, maybe even one who can play in a bit of a platoon (with the bigger proportion of starts going to Bernier, of course). He did a real nice job for the Marlies this season, backstopping them to a surprise berth in the conference final. Too bad he's 30 years old and has only six career NHL games. Trusting him with the backup job would be a blind leap of faith. Among goalies with at least 3000 even-strength minutes over the last four years, Reimer's even-strength save percentage is 20th out of 51 goalies. He isn't elite, but he's slightly above average. Actually, his .926 save percentage is tied with Jonathan Quick over that span. In all likelihood he's gone, and it'll be sad to see him go. But it will at least continue a trend of the Leafs running good players out of town. What a team. Sparks got into 21 games for the Marlies last season and played decently. He should get more starts next season to gain experience. He's only 20, so don't expect him to be suiting up in a Leafs uniform for at least a few years. Among goalies with at least 1000 minutes played at even-strength last season, Greiss had the third highest save percentage at .939, better than everyone except Tuukka Rask and Josh Harding. It's not a fluke either. Over the past three seasons (amounting to over 2000 even-strength minutes), the only netminder who has stopped a higher proportion of shots at even strength is Rask. He's only faced about 1000 shots in his career, however, and goaltender performance tends to stabilize around 3000 shots, so small(ish) sample size warning should apply (as they should with most backups). If you're looking for a backup who could push his way into a platoon, it's Greiss. But he's probably worth closer to $1.5 or maybe even $2 million. Bad in 2010-11, good in 2011-12. Bad in 2012-13, good in 2013-14. By the exact science of one year on, one year off, Peters is due for a bad year. He's faced about 2000 shots in his career and has a .904 save percentage. You could certainly find worse, but he's hardly ideal. He should be easy to sign for under $1 million, however, and with the amount of holes elsewhere on the roster (and the large, immovable contracts) saving hundreds of thousands on a goalie might be a necessity. Montoya is remarkably similar to Peters, although he's done so in a bit of a smaller sample (1400 shots to 2000). He's coming off a strong year in which he should have poached more starts from Ondrej Pavelec but he's a risky bet to repeat last year's .920 save percentage (only .923 at even-strength, 36th out of 68 goalies with more than 500 minutes). Brodeur probably should have retired a few seasons ago at this point. He hasn't been better than average in about five years, although he did have a renaissance playoffs in 2009 and was fine in the Devils cup run in 2012. Even worse, he squawked all year long about platooning with Schneider, even though Schneider was far superior and the excess games Brodeur started probably cost the Devils a playoff spot.